Out of all the rooms in a house, the kitchen and bathroom tend to be the most renovated rooms. Since the re-design of one of those rooms doesn’t end with just the updated fixtures and finishes, it’s important to highlight the accessories put in to it. Today, I am focusing on the bathroom and how to decorate it on a budget. I came up with a collection of DIY bathroom decor ideas that will take the room from ordinary to uniquely rustic chic. Whether your overall bathroom has updated finishes or not, the decor that you put in to it can have a lot of style impact. Because so many accessories can easily be handmade, you also don’t have to spend a ton of money to get a great look. Things like towel bars, tissue boxes, organizational bins, and more can have a unique and customized design when you make them yourself. All of these projects are affordable to make and easy enough for even the beginner do it yourself-er. 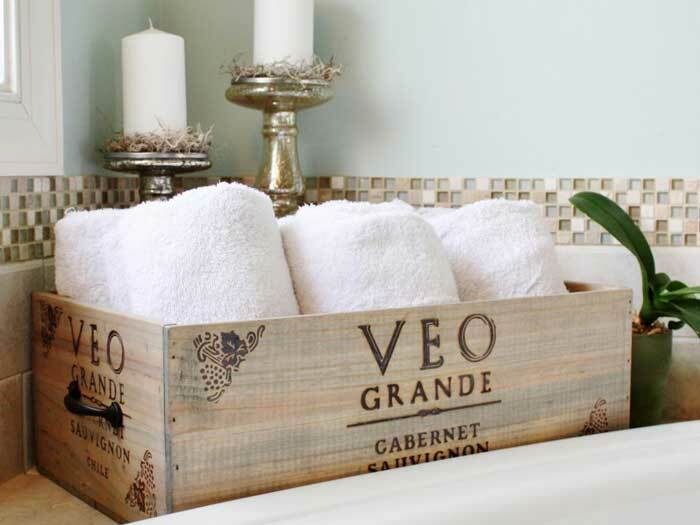 Use a wine crate or any wood crate to store extra towels or bathroom supplies. It looks especially rustic chic to store white towels in a wooden crate. The contrast is spa like and visually appealing. Added handles on the sides of a crate not only look nice but they also make it easier to lift the crate if needed. 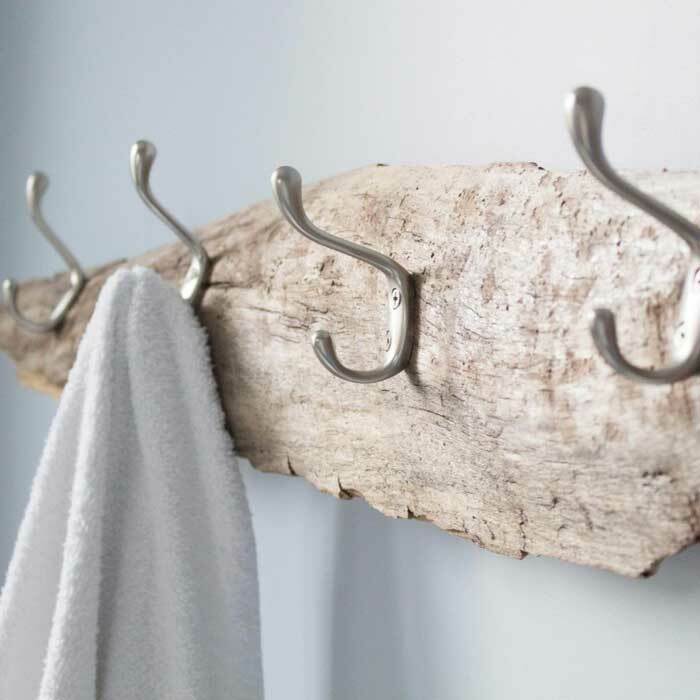 Instead of just attaching hooks to the wall to hold towels, first place them on a piece of driftwood or other salvaged wood. The look is so much more interesting and adds a warm and rustic element to the room. Your only cost is for the hooks that you attach. Think about using things like old cabinet or furniture knobs instead of hooks to reduce your costs further. 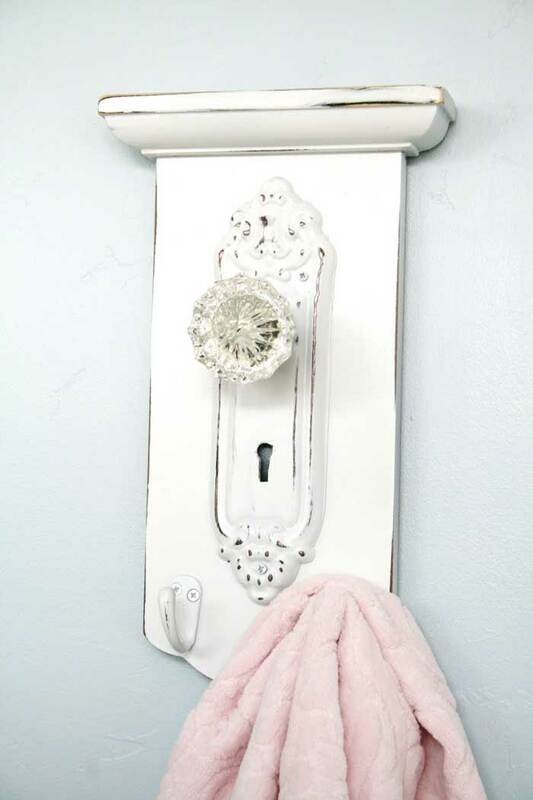 You can also use a vintage door knob to create a fun and chic way to hook your towels. 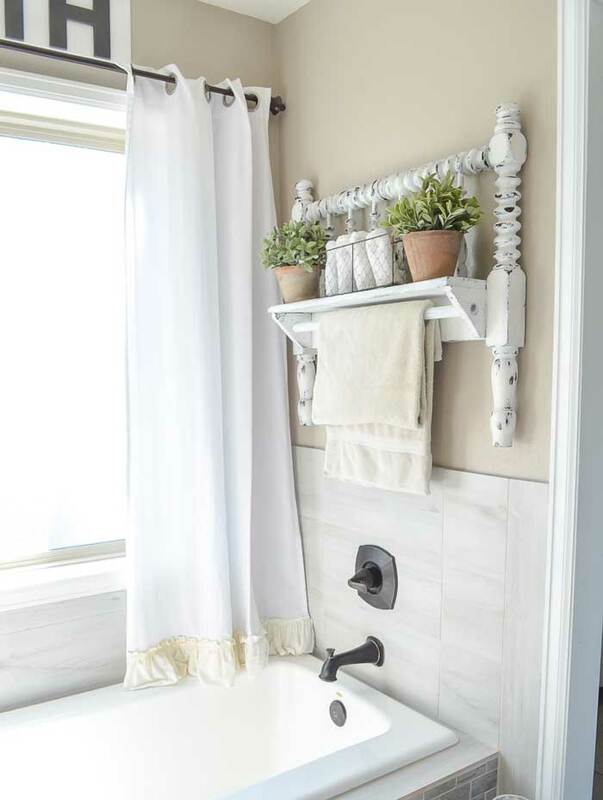 Whether you want to use the knob itself as a hook, or attach additional small hooks to the display, your towels will have a stylish place to hang. This next project shows how you can really use just about anything for a decorative towel rack. Would you have thought of using a headboard? Pretty much any surface that you can attach hooks to can become a stylish and unique hook rack. Adding a fun stencil makes the headboard even more chic. Some other things to consider using are old doors, windows, or shutters. 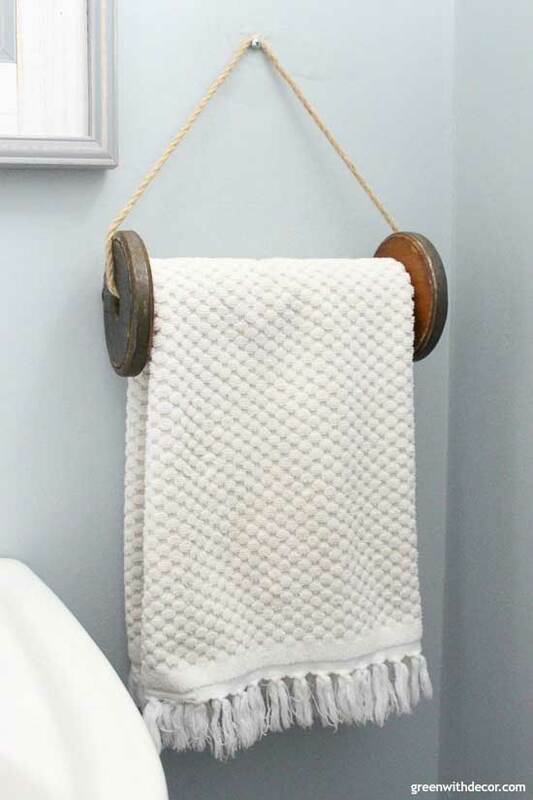 Just add hooks, knobs or bars to hang your towels. Here is another version of a bed frame towel holder. This one incorporates and added shelf and dowel towel holder. This is an especially fun look over the tub. The shelf is a great extra space for storing wash clothes and some fresh decor. I love the look of antique spools and have used them in my home for decorating. However, this idea of using one as a towel holder is super unique. Again, warm and distressed wood adds a soothing rustic touch to the bathroom. Use an old ladder and drape your towels over the ladder rungs. Instead of a traditional towel bar, use plumbers pipe for a rustic industrial look. Make a towel bar with thick rope by attaching each side of the rope to a hook on the wall. 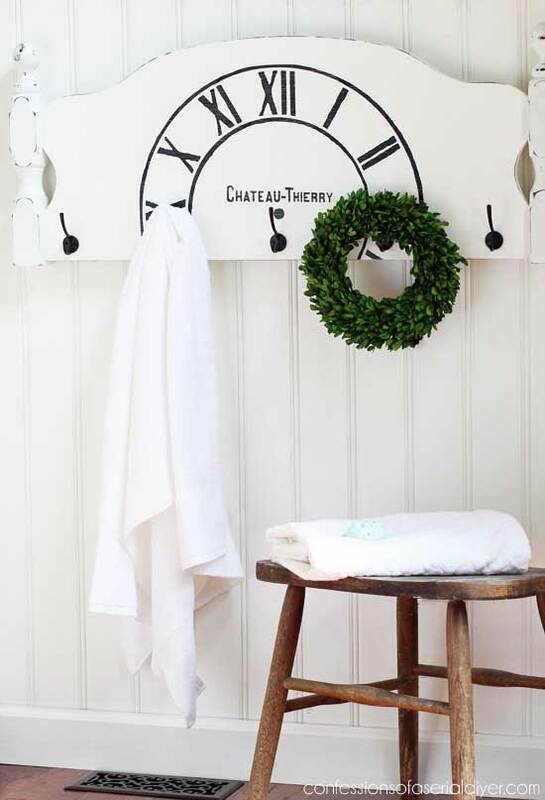 Use branches for towel or curtain holders. Suspend one from hooks on the ceiling and attach with rope for a unique and airy look. 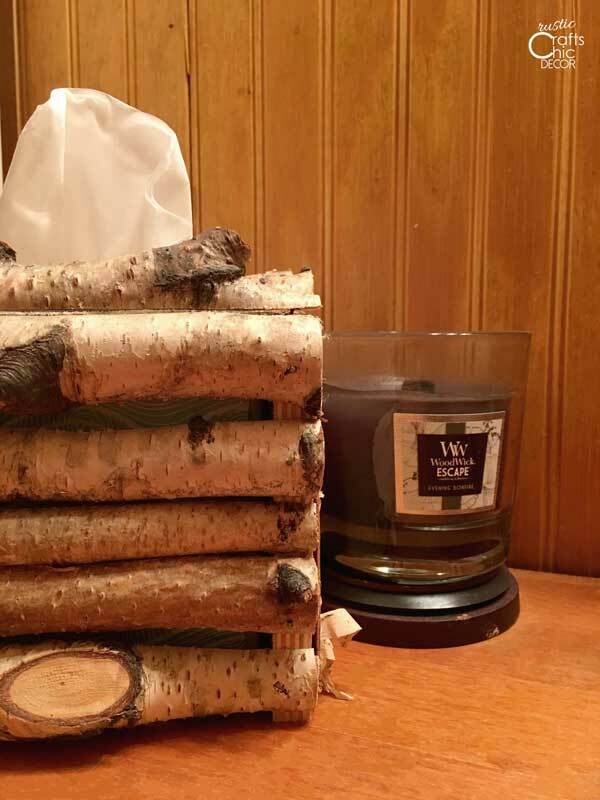 It’s especially fun to make rustic bathroom decor out of birch logs or bark. I don’t know about you, but I would rather look at a tissue box cover, made from birch, versus the tissue box underneath it. 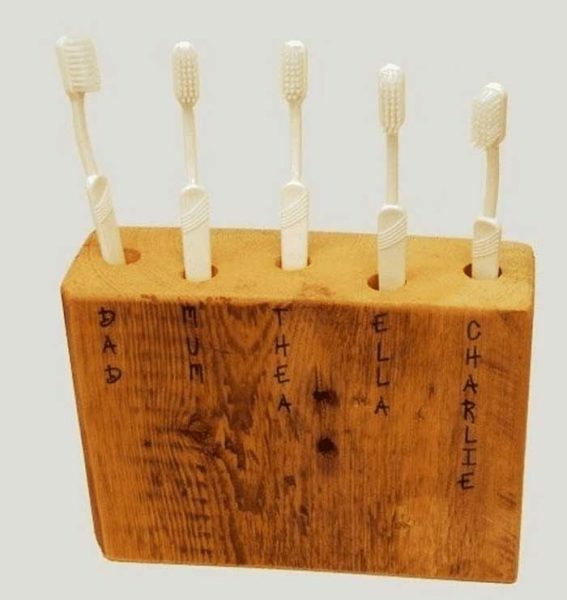 Use any chunk of salvaged wood as a toothbrush holder. It just needs to have a flat bottom and enough depth to drill holes in the top. The depth will depend on how long the toothbrushes are and how much of the brush you want to have sticking out. 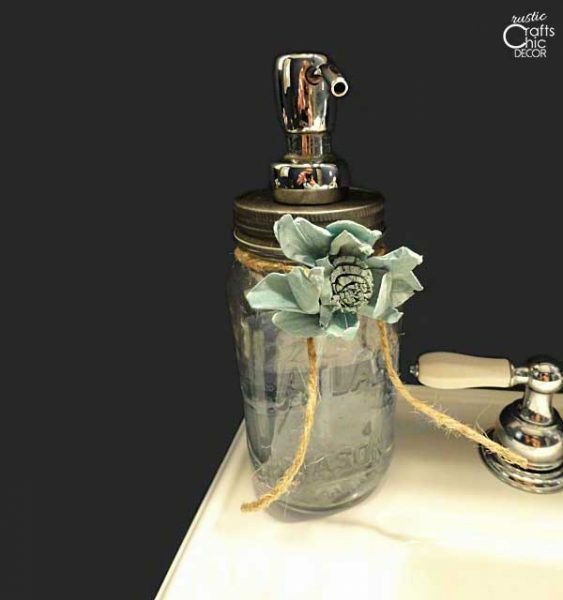 Mason jars are great to reuse in the bathroom. Make an easy soap or lotion dispenser by just adding a pump. You can also use mason jars decoratively to store things like cotton balls or makeup brushes. Leave the glass clear or paint it white for a more shabby chic look. Small step ladders are also handy to use in the bathroom. This one works to store bathroom toiletries on the steps. It could also be folded up and then hung on the wall if floor space is an issue. While hanging, the steps will still work as small shelves. 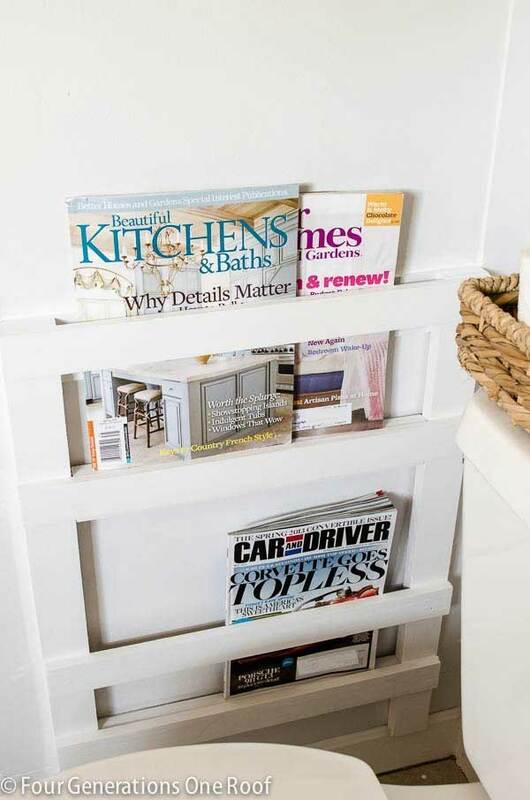 Create some interesting wall space by creating a bathroom magazine rack. The simple design is easy and affordable to make. Stain or paint the wood to suit the style of your bathroom. Instead of putting baskets on shelves, simply hang them from a couple of hooks for a minimalist look. 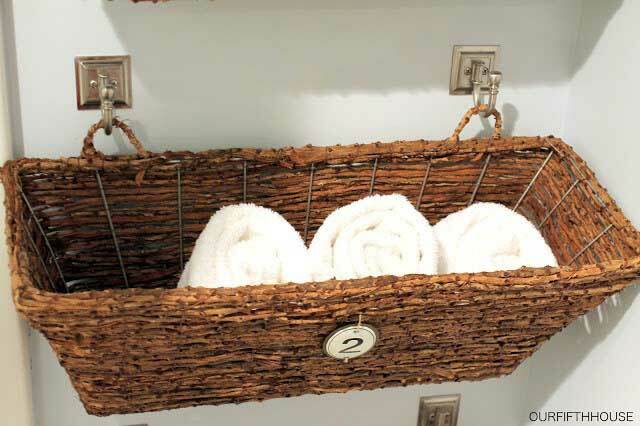 Baskets work so great for storing a wide variety of bathroom supplies. Line a wall with a whole numbered grouping. 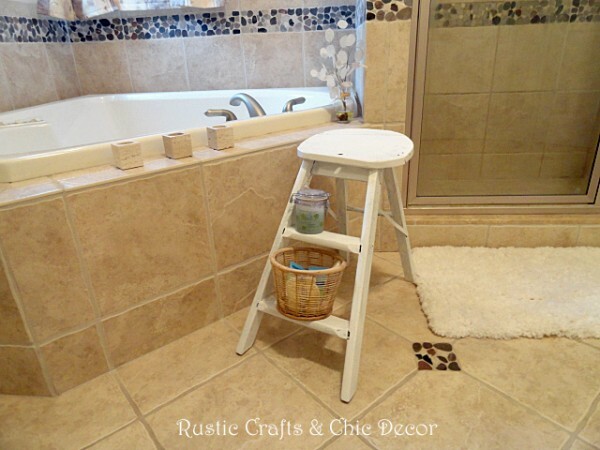 Hopefully these DIY bathroom decor ideas inspire you to create something for your own bathroom. With the cost of these projects being very low to even free, you may want to incorporate several of these for an updated bathroom. Wow, love almost everyone of these ideas. My bathroom is very small but I can use these!